1. Notes Manager - a powerful, convenient and compact means for storing notes, documentation, help files, e-books and other information. Basic editing functions: font, color, paragraph, table. Additional features: templates, styles, quick sentences, user variables, and import and export functions. It is possible to encrypt the whole document, or password protect any part of it (the tree, or folder). Using advanced features such as history, tag cloud, preview, bookmarks and hyperlinks make you more productive and comfortable. 2. Contact Manager - TreeDBNotes Pro allows you to store, manage, and with the import and export functions, synchronize contacts with other sources. For example, you can import contacts from a mobile phone, edit and put them in contact Google. 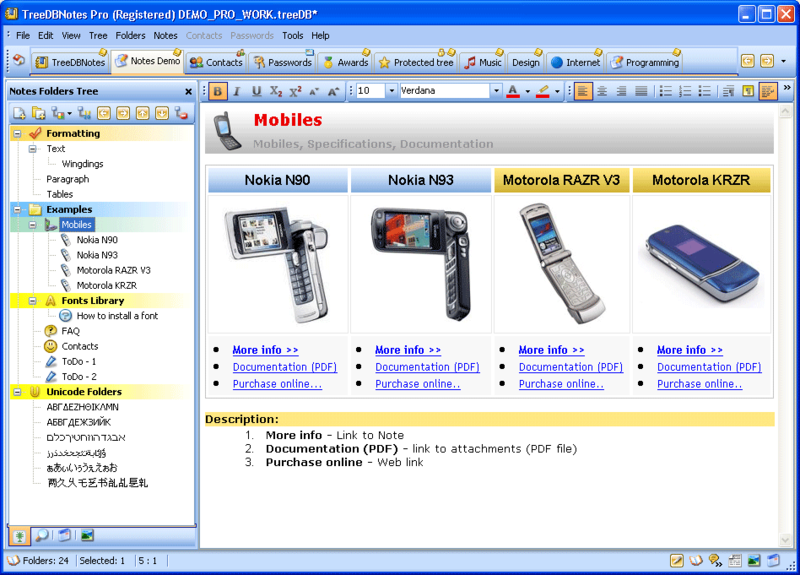 Additional functions that are available: web search, copy to clipboard, links, attachments, notes, etc. Qweas is providing links to TreeDBNotes Pro 4.26 as a courtesy, and makes no representations regarding TreeDBNotes Pro or any other applications or any information related thereto. Any questions, complaints or claims regarding this application TreeDBNotes Pro 4.26 must be directed to the appropriate software vendor. You may click the publisher link of TreeDBNotes Pro on the top of this page to get more details about the vendor.